Literature, art and a personal connection. “Facing the Storm,” interpreted from The Catcher in the Rye. Archival matte paper prints of this Catcher in the Rye painting can be purchased here. Over the past couple of months, I’ve been writing about the “Catcher in the Rye” custom oil painting I’ve been working on for Jeff, a client of mine. 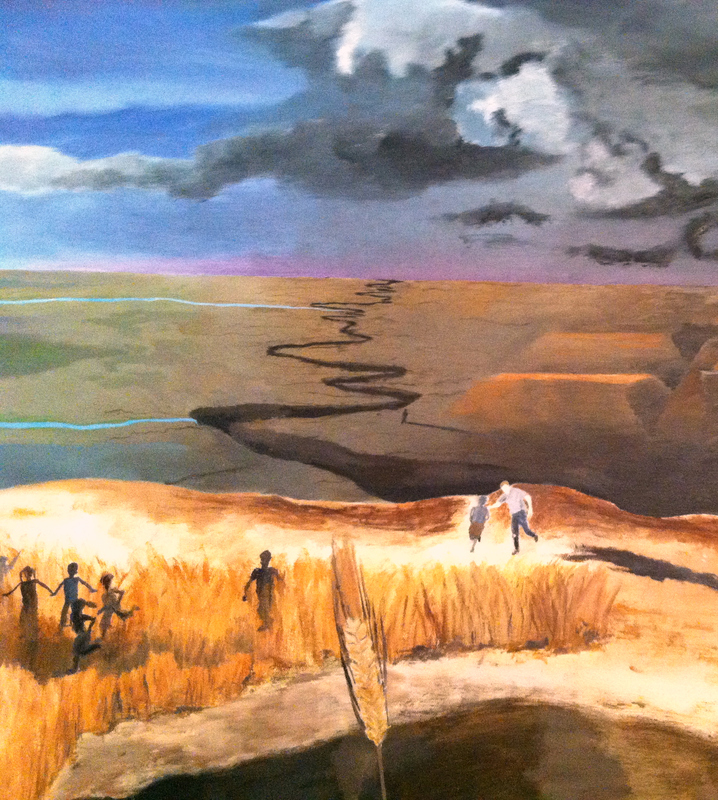 It’s called “Facing the Storm.” Alas, I have the completed pictures and story behind the art! Although I’ve given some explanation into the meaning of this painting, I’d like to reveal a bit more. When Jeff was a child, his father gave him this book. On the front cover, he wrote a note – “Jeff, I hope you enjoy this as much as we did.” “We” referred to his Dad’s girlfriend at the time. Jeff still has the book his Dad gave him; it’s actually the same one I read before starting this painting. Anyways, the book made a significant impression on Jeff, since the main character – Holden Caulfield – reminded him strongly of his Dad. Jeff’s parents divorced when he was young. His Dad, who was a drug addict, became increasingly absent from his life starting in high school. Several years later came a permanent absence – he committed suicide. “I like to imagine that, on the night before he took his life, my father went to a seedy dive bar for his last hits. His sandy colored hair was unkempt and balding in places that only bald after years of mental anguish. His jacket was dirty and hanging loosely around frail bones, the kind of frailness that only comes from many injections of abuse. His blue eyes, though, were friendly. One side of his lips curled up into a strange but open smile. His face was shining, though it was probably the kind of brightness that comes from two lights in constant tension, one always threatening to overcome the other, each frustrated by the shadows they cause. Taking a stool, he saddled up to the bar and tried to explain himself in the words of my favorite song. Nodding sympathetically, the bartender asked him if he had any kids. Slowly, the bartender nodded again. The next night, the darkest of his life, my father held a gray blade and wondered about the bartender’s words. How could it be that, after all the pain and struggle he caused himself and his family, he had done a fine job of raising his sons? Then some final truth dawned on him. Love is not good, simple, and pure. This does not mean that it is its opposite, because neither is love some demon that needs to be exorcised. Always and everywhere, love is both brilliantly optimistic and incomprehensibly execrable. Struggling like every parent does to put it together in just this way, my dad was able to perfectly raise his two children. Although Holden Caulfield’s vision of being the Catcher in the Rye is very descriptive, Jeff and I took that vision and added in a few more features that relate to his own story. Most prominently, his Dad took the place of Holden Caulfield on the cliff. Jeff gave me several photographs of his Dad, which I used to paint a figure resembling him on the cliff. In the painting, he’s catching and saving a child who is running off of the cliff. Down below in the valley, you’ll notice someone walking towards the storm. That figure represents Jeff himself, as Jeff’s Dad never was able to “catch” him. The changing skyskape, from bright and cheery to dark, stormy and dangerous, is also Jeff’s idea. You’ll notice that the darker side is the side by the cliff, where Jeff’s Dad is. I added the lush blue rivers that run through the mountains and valley until they abruptly come to an end at a split in the earth. I’m happy to say that Jeff is very pleased with this painting! He says that it’s very therapeutic for him, and although it depicts a dreary side of his family’s past, he feels peaceful when looking at it. It was a pleasure to make a painting for someone that carries so much meaning! Posted in Art, custom art	"art with meaning""custom art""dave white art""The Catcher in the Rye art""The Catcher in the Rye painting""therapeutic art"
Amazing! I remember reading that book in my grade 9 English class. It’s actually the only book in all of high-school that I actually read (instead of looking up summaries online…). What can I say, I’m a math person, not a literature one… I think it’s great that you were able to draw inspiration from such a great book and turn it into an incredible painting. Thank you Agata. I also didn’t enjoy reading too much in literature classes, but didn’t read this one until a few years ago and really enjoyed it. As embarrassing as it is to admit it, I think it was all the swearing that intrigued me and kept me reading at the time… I couldn’t believe it was allowed in school! I’m late to this party, but wow….everything about this painting…and the words of the young man who commissioned it are absolutely stunning. Though you’ve heard it plenty I’m sure, remarkable job…. The party is ongoing! Thank you for your kind words. This is astounding. I was doing some research for a project we are to do in a class I attend and came upon this painting. I was immediately taken aback and had to stop to simply take it in. When I found the description it brought tears to my eyes. You did a beautiful job at capturing all aspects; as someone mentioned above. I was able feel the message even without knowing the whole story. Rebecca, thanks for your comment, it means a lot to hear someone else’s appreciation of this painting! I’m really taken with your painting and the story behind it. Thank you very much. This is one of the more unique paintings I’ve done.